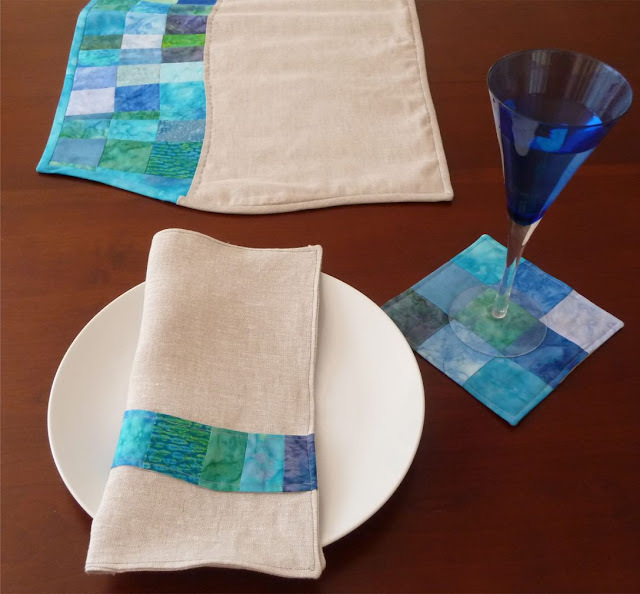 These napkins are part of a set I've been making with scraps from my Keeping It Together watercolor quilt and Robert Kaufman Waterford Linen. 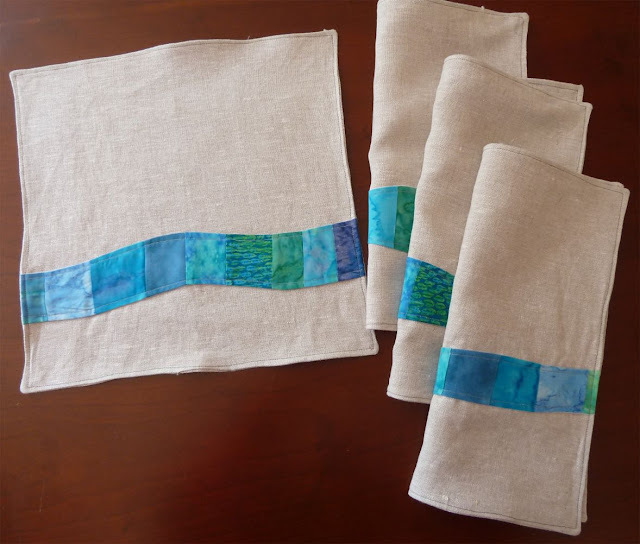 Check out my tips for sewing with linen before you get started. Finished size 12". Begin by assembling your patchwork strip set. Layout your fabric strips in a pleasing arrangement and sew them together until your patchwork is 13" wide. Press all of your seams in the same direction. The longer the strips the more napkins you can make from a single strip set. Place the strip of fusible on top of the strip set with the fusible side against the right side of the strip set. Cut both pieces using a freeform wavy pattern with gentle waves. Try not to make your wave too narrow. With the fusible and wave still layered as you cut them stitch down both sides following the curves. Carefully turn your wave right side out so the fusible glue is now on the outside back. Finger press along the edges and poke out your curves. Fuse your wave to one of your linen squares and topstitch along the top and bottom edges. I offset mine on the bottom third of the napkin. Trim the edges of your wave flush with the napkin. Place the second linen square on top so the wave is in the middle. Sew around the square leaving a hole for turning. Trim the corners, turn and press.